I really enjoy growing and preserving my own food including making my own homemade jam. If you’ve never had homemade jam, then you really haven’t lived. Seriously, it’s so much better than store-bought and there is a satisfaction that comes with making it yourself. Even sweeter than making your own jam is if you can grow your own berries or at least pick them yourself. Blackberries are easy to find wild and strawberries are fairly easy to grow on your own. I can’t wait to get into our new house so we can plant fruit trees, blueberry bushes and strawberry plants. As berry season approaches, I’m beginning to use up the rest of our frozen fruit and jams which is where these Blackberry Jam Bars come into play. 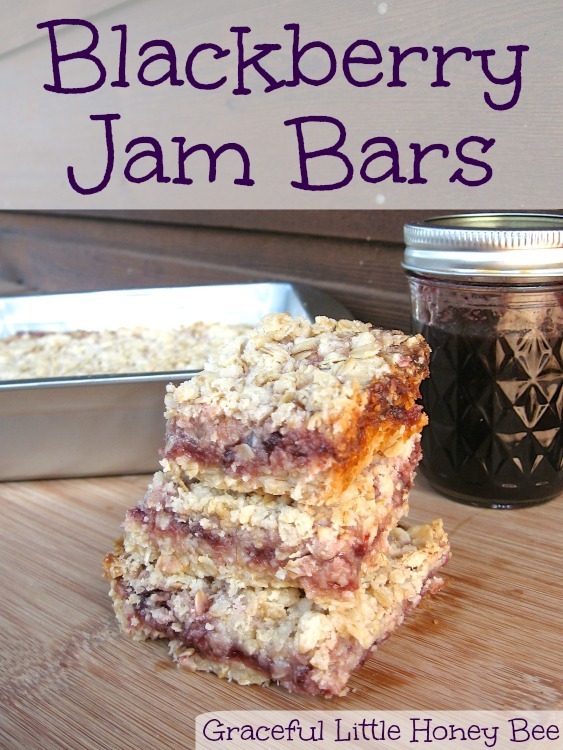 I only have a couple of jars left of my blackberry jam, but I still have quite a few freezer jams to use up so I figured I had better get to eating and these jam bars are a great way to use homemade jam. They are easy to put together and taste amazing. My husband was throughly impressed and he normally doesn’t get too excited about desserts. Step 1: Preheat oven to 350 and grease square baking pan. Step 2: In medium bowl, mix oats, flour, sugar and salt. Step 4: Pour half of the oat mixture into baking pan and press down firmly. Step 5: Spread jam evenly over mixture. Step 6: Sprinkle the rest of the oat mixture over the top and pat down lightly. Step 7: Bake for 35 minutes. Let cool and cut into bars. Do you make your own jam? Do you have any recipes that use jam in them? I’d love to know! Preheat oven to 350 and grease square baking pan. In medium bowl, mix oats, flour, sugar and salt. Pour half of the oat mixture into baking pan and press down firmly. Spread jam evenly over mixture. Sprinkle the rest of the oat mixture over the top and pat down lightly. Bake for 35 minutes. Let cool and cut into bars. Can't wait to try these! So simple! Thank you! Oh, boy...these look so yummy! I love this recipe! Thank so much for the simple recipes! Yes, your recipes are quite wonderful on here. My 4 year old can even make the oatmeal bars so that really helps me out! can I use quick oats ? ?